Excellent sound controls, quality speakers, and a solid design. 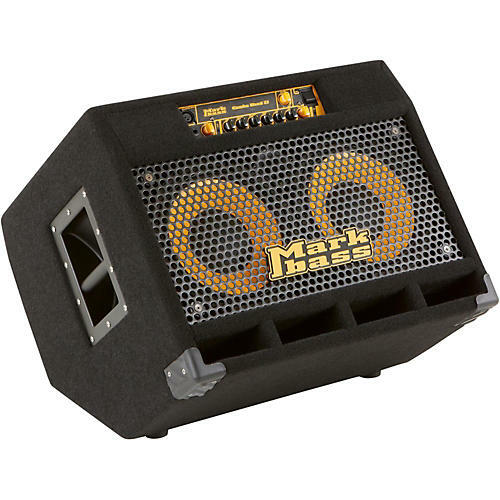 The Markbass CMD 102P amp's I/O includes an input that can handle both passive and active basses, and extra XLR balanced input for double bass pickups, Neutrik Speakon Combo out jacks for use with 1/4" or Speakon speaker cables, a tuner out jack for sending unbalanced signals to a tuner, amp, or other recording equipment, and Send and Return Effect jacks to ensure your main signal continues even if something dies in your effects chain. This versatile bass combo has an angled cabinet so that you can use it as a floor model or in the more traditional vertical position. Either way, you're going to get a warm, natural sound from the 2 Markbass custom 10" speakers and the piezo tweeter. And if you add an external cab via the outputs, the CMD 102P combo amp will give you enough sound to fill a large venue with headroom to spare.